Lily Stockman is a painter living in Los Angeles and Joshua Tree. January 1st Alliteration: Walking in the desert under the full moon carrying my seven-month-old daughter, Olympia. The light was so bright I could see the blueness of her wide eyes, two big, sparkling O’s under the enormous O of the white winter wolf moon, the O of my little O-lympia. I saw the David Hockney retrospective at the Met. I read Anne Truitt’s description of the creative process in Daybook. I found a bank of blooming wild California buckwheat in a south-facing wash in Roadrunner Rut. A shift in my work in the studio. I’m preparing for a show and the crockpot of anxiety of a looming deadline has finally smoothed out into a positive, energizing force. I learned a long time ago I need deadlines, but I’m only finally learning how to use them as helpful structure instead of impending dread. My sister Grier really approaches everyone with kindness and I see how her empathy and humor make the world more agreeable. My sister Hopie gave my daughter a tiny Swedish glockenspiel for Christmas, and it’s the most beautifully designed object – a small maple frame set with brass tone plates, which are buffed with beeswax (Need an idea for a poem? Swedish honey bees making beeswax for a child’s musical instrument! Can you even bear it?!). It’s in the pentatonic scale, which means any improvised melody always sounds pleasant. “It will never give you the feeling that you’re playing “wrong.” It will always sound good.” I love the philosophy of an instrument for children that will always sound beautiful, harmonious, good. How optimistic is that? My dad gathered deadwood from his favorite trees around our farm –red cedar, ash, black walnut, apple, osage, sassafras, spalted maple– and made wooden blocks for my baby daughter. I collected rocks on hikes throughout my pregnancy as a way to mark time, place, experience. They were scattered around our house. Now I have the baby and I don’t really need the rocks any more; I whittled the collection down to a few pieces of pocked volcanic rock from Amboy Crater – it looks like black coral – and everything else is in a basket. It’s just a basket full of rocks taking up space. Collectively they probably weigh about the same as the baby. I’d like to return them over the course of hikes in 2018... put them back. It was like taking out all the library books I needed to learn about, say, humpback whales, and now that I have one (a whale / a baby – truly what is even the difference) I can return all the books. My sisters Hopie and Grier and I threw a surprise birthday party for our sister Phoebe last night. I’m hungover as I type this. Our friend Mary Lattimore was just in Iceland playing her magical harp with Sigur Ros, and she came straight to our little dinner party to play for Phoebe, to usher in the new year of her life. She was spellbinding. I was so grateful in that moment for the gift of my three precious sisters, and for Mary’s gift of music to us all. 09 Proportion: A specific moment that reminded you of the scale of the universe. That you are part of a greater whole. and clambered back down the mountain in excellent spirits, knowing hot showers and black eyed peas awaited us back home. A small unfinished painting for an upcoming show in New York. Mary Ruefle, which I always see as "Marry, Ruffle"
Hardware cloth to keep the antelope squirrels out of my prickly pear. A rug my sister Hopie and I designed this winter for Block Shop. 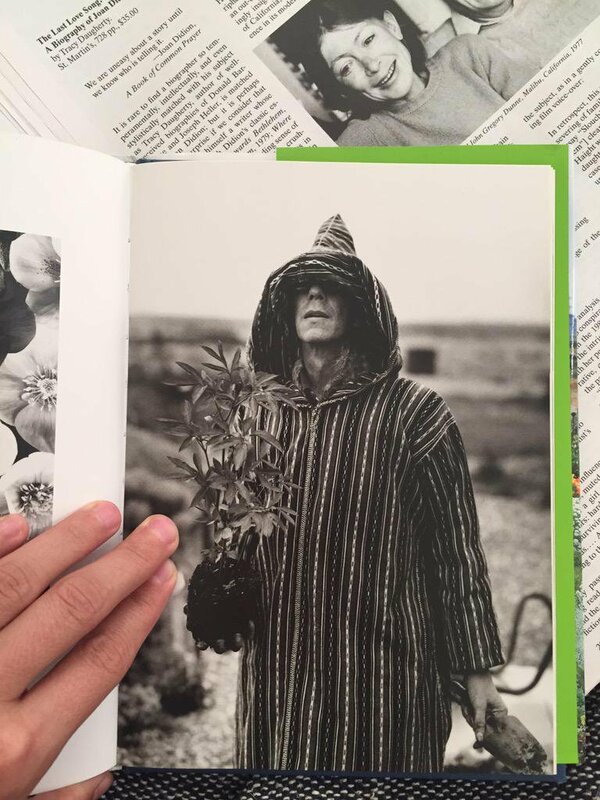 Joan Didion smiling at Derek Jarman and his dug-up hellebore. Why not. Last light of the year on the cholla outside our back door. I'm holding my daughter who's watching the dog who's chasing a rabbit over the threshold of January.